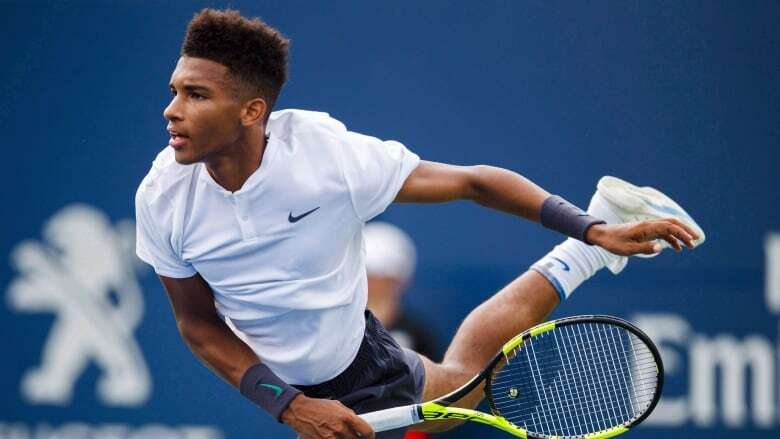 Canadian Felix Auger-Aliassime is moving on to the second round of qualifying at the U.S. Open after a 7-5, 6-3 win over Tallon Griekspoor of the Netherlands on Wednesday. The 18-year-old from Montreal, who is the world No. 116, won 73 of the total points to Griekspoor's 63. Auger-Aliassime, the 2016 junior U.S. winner, had nine aces and five double faults, while winning 69 per cent of points from his first serve. He also broke Griekspoor four times. Auger-Aliassime is slated to face 235th-ranked Christopher Eubanks of the U.S. on Thursday. In other men's action, Filip Peliwo of Vancouver lost to Marcel Granollers of Spain 7-6 (4), 6-2. On the women's side, Francoise Abanda of Montreal dropped the first set to world No. 212 Jessika Ponchet, before surging back to win 1-6, 6-2, 6-3. The 21-year-old, who is ranked 210th, will take on Beatriz Haddad Maia of Brazil in the second round of qualifiers on Thursday. Later on Wednesday, Bianca Andreescu of Mississauga, Ont., was ousted by Olga Danilovic of Serbia in straight sets 6-3, 7-5.